By Mustaza Mustafa in Internet. Updated on April 26, 2018 . When you need to send important information via an email to a person or client, all you can do is send an email and wait until the recipient has replied to know that they have received and opened the email you sent them. During times of urgency, this can be a source of distress for you. With Microsoft Outlook, there is the ‘receipt’ function which allows your email recipient to send a notification telling you that they have read the email. But even this requires an action from them. If they choose to ignore it, you wouldn’t know if they have received and read the email. There are many solutions for this but most will require you to send an HTML type email where a script will be placed in the email itself. But now with RighInbox, you can forget all that fancy HTML email settings, and still be notified when a person opens and reads your email. 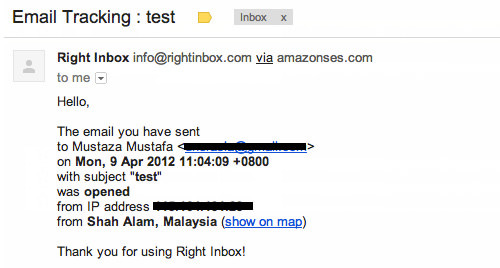 RightInbox is a Chrome browser extension for Gmail that will allow you to schedule the sending of an email, and now with the extra feature to track when your email is opened. It’s very easy to start with, all you need is the Chrome browser, and the RightInbox extension. Download and install. After Installation is done, open your Gmail Inbox or refresh if it’s already opened. A notification will appear, click ‘Continue’ and then follow the instruction to allow it to access your Gmail. Now to start tracking your next email, click on ‘Compose’ button in your Gmail Inbox. In the compose area, you will see an additional ‘Track’ button appear in-line with your ‘Send Now’ button. To track this email, simply check the ‘Track’ button before you hit ‘Send Now’. That is all you need to do, a simple ‘check’ will help you find out when the email is opened. There is no script required and RightInbox will track the delivery status even if your email content is just a simple plain-text. Now when the email you sent is opened by the recipient, you will be notified via email with a little more details, that includes the IP and location. The email tracking by RighInbox is made simple with Chrome browser, and there is no other script to be included in your email content. The notification is sent to you via an email, not via browser popup notification so you can always find out the status of your email even if you are away from your Chrome browser and your computer.